When we woke the morning of Wednesday the 26th, the rain was gone and the sky was blue. Our task was set before us--cram four days worth of Lake Tahoe fun into two. We always try to take a hike while in Lake Tahoe. A hike is a great way to burn some calories during a vacation during which you are eating chips and drinking margaritas every night, but more importantly, it is a great way to see areas of the wilderness that the average Lake Tahoe going couch potato doesn't get to see. There are a wide variety of hiking opportunities around the immediate South Lake Tahoe area, but I knew the one we took on this particular morning was not ranked among the easier on the hiking difficulty spectrum. The trail to Velma Lakes is ranked as a 3 out of 5 in my book, "California Hiking" and a 9 out of 10 in terms of scenery. Most other sources consider this trail to be intermediate to advanced and "not for novice hikers." Though this trail actually branches to Upper, Middle and Lower Velma Lakes, the most popular and easiest of the three is the trail to Middle Velma, which will be reached 3.8 miles and 1300 feet in elevation from the Eagle Falls Trailhead, located 8.5 miles north on Highway 89 at the apex of scenic Emerald Bay. We left our house in South Tahoe at 8:30 and were able to get one of the coveted parking spaces on the highway, close to the trailhead but not in the $5 Day Use parking fee area. The trail follows along the very popular Eagle Lake Trail for the first mile, and then branches off on its own toward your Velma Lakes destination. The entire trail offers spectacular views and some very rugged hiking. We had Middle Velma Lake all to ourselves. The water is too cold for swimming (and that's saying something because we swim in Lake Tahoe) but it was sure nice to dip those hot "new hiking boots" feet into the icy water and sit a little. Unfortunately, we did this trail in a bit of a time crunch, so we really pushed ourselves. Some pretty wicked foot pain ensued on the way down and some pretty serious muscle aching followed us around for a few days. I do recommend this hike but it is not for the faint of heart. Ninety percent just ain't gonna make it. Well, when you go to Lake Tahoe, you simply have to patronize a marina. This is the place you go to rent your kayaks, canoes, motorboats, jet skis, and board your paddlewheel boats for scenic historic tours of Emerald Bay on the Tahoe Queen or the MS Dixie II. There are marinas all over the South Tahoe area: Ski Run, El Dorado, Camp Richardson, just to name a few. We used to be a Zephyr Cove family, but for the last several years we have been going to Round Hill Pines. Round Hill Pines is closer to South Lake Tahoe and is not nearly as crowded. One year we went to Zephyr Cove and they told us we couldn't rent more than one jet ski at a time. What??? Well, that solved that. We found another marina. Zephyr Cove probably has more boats and selection, but their silly one time rule pushed us elsewhere. The lake is the lake and a jet ski is a jet ski, and jet skiing on Lake Tahoe is an absolute hoot. You can rent for half an hour or one hour at a time. When you do it like we do half an hour is plenty. I also recommend that the driver have plenty of upper body strength in order to handle the jet ski, otherwise your arms could rip right out of the sockets. I am always good and sore after a morning on a jet ski. 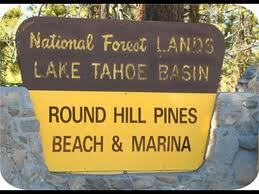 Round Hill Pines Marina is located at 325 Highway 50, 89448, 5 minutes east of the Nevada state line. Truly this could be a posting all by itself. Sand Harbor State Beach holds a place on my list of the 10 best places in the world, and truly may be in the top three if I ever really took the time to make such a list. My husband and I discovered Sand Harbor while on a little weekend getaway to Reno almost ten years ago. We loved it so much on Saturday that we returned on Sunday, and since then it has been a "must do" on all our trips to Lake Tahoe. Sand Harbor is located about 40 minutes from South Lake Tahoe on Nevada State route 28 just south of Incline Village and about 8 miles north of Spooner Lake and the Highways 50 and 28 junction. It costs 12$ to park at Sand Harbor and there's not an easy way to avoid this fee. When we come we prefer to park a little farther south from the entrance, which seems to be less crowded but still close to restrooms and walking distance from anything you would need to get to. The water at Sand Harbor is perfectly clear and still. From our little yellow inflatable raft floating on the cold waters you can turn to face the granite and green cliffs that encase the swimming area. For those who dare (and we dare) the swimming area is large and safe. There are restrooms with showers nearby, a small restaurant/grill, picnic areas with barbeque pits, and lifeguards. To the north portion of the beach there is a Trex decking pathway that leads along an interpretive trail and to a lot of boulders for rock hopping. Sand Harbor is also home to the Lake Tahoe Shakespeare (www.laketahoeshakespeare.com/) festival that runs every summer. One thing we have started doing at Sand Harbor is catching crawdads (or crayfish, whichever you prefer). All you need is some sticks, a weight, long string, bait and a large bucket to collect whatever you catch. Dang! I fell for the hot dog trick again! 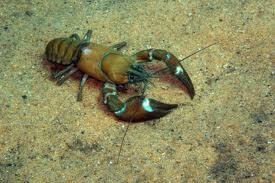 Crawdads are small lobster like creatures that tend to live in dark crevices and under rocks submerged in water. They are super stupid and can't resist that bit of salami or hot dog when dangled right in front of them. They come out from under the rocks and slowly approach their new found meal. Greedily they cling, failing to realize they are being drawn out of the water. The transfer to the bucket is the hard part, as this seems to be the moment of realization of impending capture, causing many to release the bait for a shot at a longer life. Anyway, over the years we have gotten quite sophisticated. We used to tie the bait up with rocks but rocks get loose easily so now we have graduated to nuts or washers, which work far better. We have tried all kinds of bait, ranging from chicken gizzards to ribs to salami. Craig says salami works best. One bit of trouble is fighting off the little fish that also like the bait. They can be quite a nuisance, as they block the path to the bait. We also have a huge "True Value" paint bucket now, no more sand toys. Anyway, sometimes they are biting, sometimes not. We see how many we can catch and then we let them go. Most are really small and wouldn't make much of a snack anyway. At Sand Harbor you can catch crawdads anywhere there are rocks in the water. We always go to the end of the interpretive trail and jump over some boulders and down to a little enclosed space just sheltered from the open lake. Flip flops are ill advised. Whenever doing any kind of boulder hopping I recommend a good pair of water sneakers everyday of the week and twice on Sunday. boulders into the icy Lake Tahoe waters! Once we get started it's hard to stop--it's fun and a little scary and downright cold all at once! Simply crawl out through the boulders to the open lake, find a deep enough spot (which is easy to determine because the water is so clear) and JUMP!! Well, remember our mode where we had to cram four days of Tahoe into two? Well, after leaving Sand Harbor Beach at 5 my kids insisted that we go to Magic Carpet Golf because ....we always do!!! Magic Carpet Golf is located at 2455 Lake Tahoe Blvd in South Lake Tahoe and weather permitting is open daily from 10 am to 10 pm. There are three available courses, Dinosaur and Storybook, which are the usual 18 holes and cost $8.50 and Castle, which is 28 holes, newer, and costs $12. Since we had no time constraints today, we chose at long last, Castle. Thank you for reading this post! We are off to Pennsylvania for three weeks! Look for upcoming posts about "the Keystone state!" 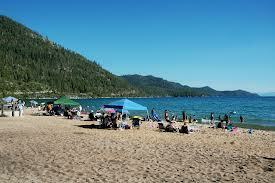 Isn't Tahoe the best for family vacations? I'dl love to get to this beach and also the hike one day. My only question is about skipping paying the parking. Isn't that charged to help maintain the parks and restrooms? I feel like it's a justified fee if you are taking a family there all day. Also, I don't like leaving my car parked on the highway for safety and security reasons.You know? I would love to see your pictures bigger! The kids look so cute. Sounds like you guys had a wonderful summer! You are the best vacation planner!